KATHMANDU, April 27: Nepal Stock Exchange (Nepse) index slumped 81.27 points this week to close at 1,357.22 points on Thursday -- the last trading day of the week. The stock market again turned bearish following a recovery in the past three weeks. The stock market was on a recovery path amid expectations among investors that the interest rates will see correction soon after the government's spending goes up in the last quarter of the current fiscal year. With the rise in government spending, there are expectations that the current shortage of lendable fund will ease. 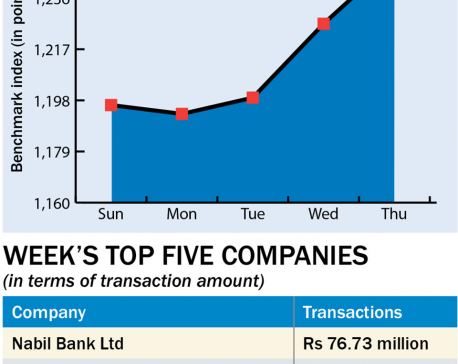 The recent policy of the Nepal Rastra Bank that allows banks to borrow from foreign banking institution has also boosted investors' confidence. “While there were high hopes that the interest rates will come down, the situation in real has not improved,” said a stock broker. “The recovery was also mainly due to rise in demand for stocks whose prices have gone down while the market was on a bearish mode. However, the selling pressure has outpaced the buying pressure in recent days,” the broker added. The listing of bonus and rights shares of many companies, particularly bank and financial institutions and insurance companies, has also increased supplies of shares in the market. All trading groups ended on the red zone this week. Insurance group suffered the biggest loss as its sub-index dipped 452.83 points to close at 6,913.49 points. Hydropower group fell 137.6 points to end at 1,661.47 points. Sub-indices of Hotels and Development Bank also went down by 166.46 points and 110.73 points, respectively, to settle at 1,978.28 points and 1,578.64 points. Similarly, Microfinance group ended 102.87 points lower at 1,698.81 points. Banking, the heavyweight trading group in the secondary market, also logged a loss of 68.33 points to end the week at 1,176.65 points. Manufacturing and Processing group also shed 87.57 points to close at 2,315.98 points. Sub-indices of Finance and 'Others' groups also fell 36.15 points and 35.42 points, respectively, to close the week's trading at 673.48 points and 754.38 points. 'Trading' group also saw its sub-index go down by 3.29 points to end the week at 202.69 points. 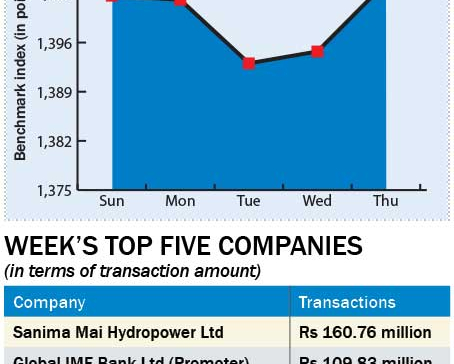 A total of 10.19 million units of shares of 182 companies worth Rs 4.7 billion were traded in the market this week through 47,071 transactions. The turnover is 14.86 percent higher compared to last week. 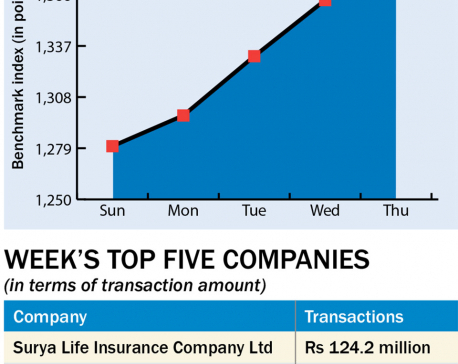 Nepal Bank Ltd topped the list of companies in terms of turnover (Rs 191.5 million) and number of shares traded (524,000 units), while Premier Insurance Company Ltd was at the top of the listed companies in terms of number of transactions (1,505). 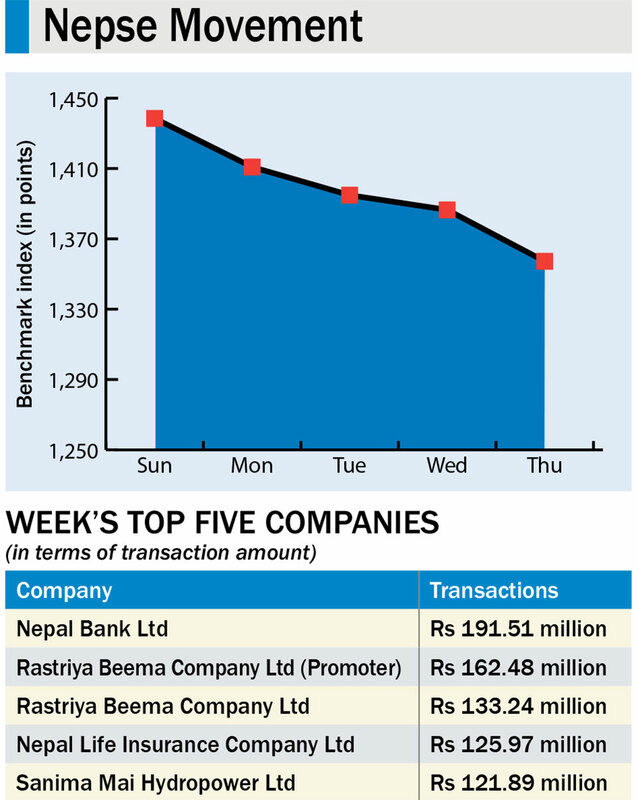 Rights shares of two companies, bonus shares of 15 companies and ordinary shares of one company were listed in Nepse this week for the trading.